Some lucky New England fans had a chance to ski with Olympic gold medalist Kikkan Randall Thursday in Vermont. Some lucky New England skiers had a chance to share the sport they love Thursday with an Olympic gold medalist. Kikkan Randall helped end a long medal drought for the United States in cross-country racing last year at the Winter Olympics in South Korea, when she and Jessie Diggins raced to a historic victory in the women’s team sprint. “I’m so honored to have been able to represent our country in five Olympics,” Randall told necn and NBC10 Boston. More than a year after winning Olympic gold, Randall is still glowing. 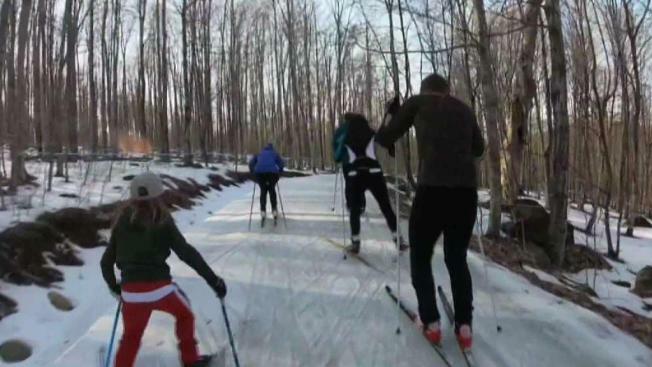 Now retired from active competition, Randall visited the Sleepy Hollow Ski Center in Huntington, Vermont for a community ski day, put on by her sponsor, Fischer Skis, and Skirack, a leading Burlington equipment retailer. The five-time Olympian told necn and NBC 10 Boston with the cross-country medal drought broken, she’s seeing increasing participation in the sport and a new confidence from young athletes. “I’ve been blown away by the impact I can see the gold medal is already having,” Randall said. High school junior Julia Oliver skis with the Mansfield Nordic Club, and said she was grateful for some advice from the medalist—specifically tips on how to start a race and how to keep your core tight to maximize momentum. “She just wants to share the love that is Nordic,” Oliver said. Randall is now working with the U.S. Olympic Committee and International Olympic Committee to support and empower athletes. She said her aim is to preserve what she calls the Olympics’ unique ability to inspire the world through achievement. “I hope I can do some work to make sure it’s going to be like that for generations to come,” Randall said.